LOOKING FOR THE 2014 GANDER MOUNTAIN AD? CHECK IT OUT HERE. 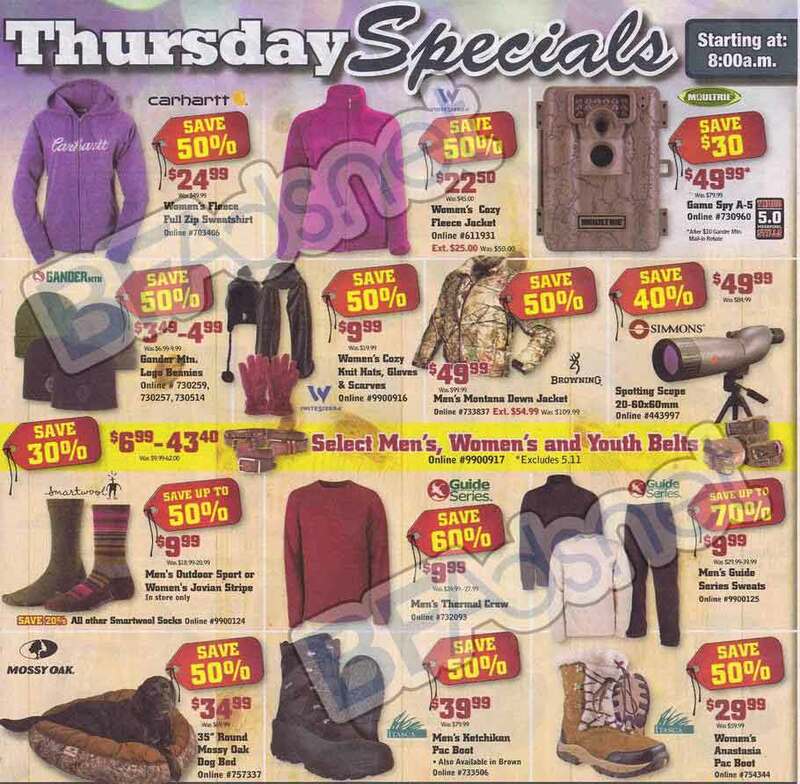 FOR A FULL LIST OF BLACK FRIDAY AD SCANS, CHECK OUT NERDWALLET’S BLACK FRIDAY AD LEAKS PAGE. NerdWallet appraises the deals and steals of Black Friday ads when they arrive. If you have not found your retailer of choice, check out the site again soon! 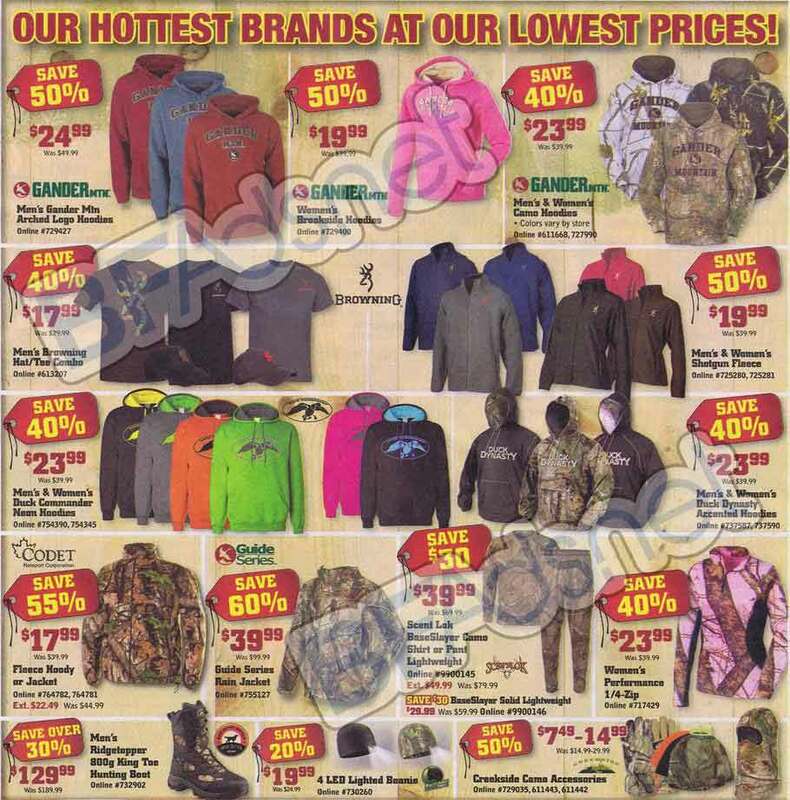 The Gander Mountain Black Friday 2013 ad has finally arrived! 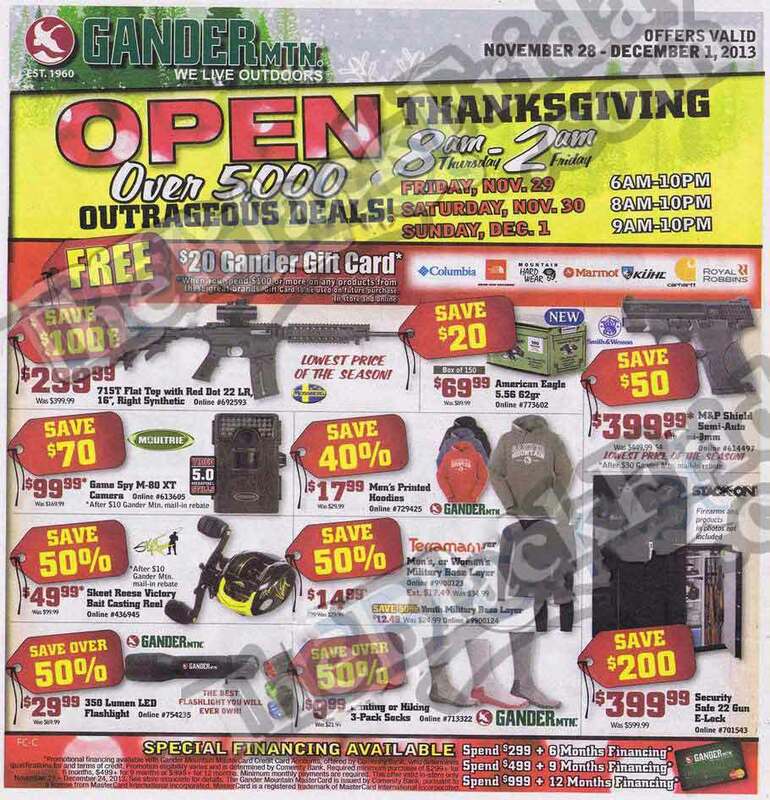 Gander Mountain is nearly Number 1 when it comes to early sales hours – the outdoor-oriented retailer will be starting their event at 8am on Thanksgiving Day and continuing all the way through Sunday. 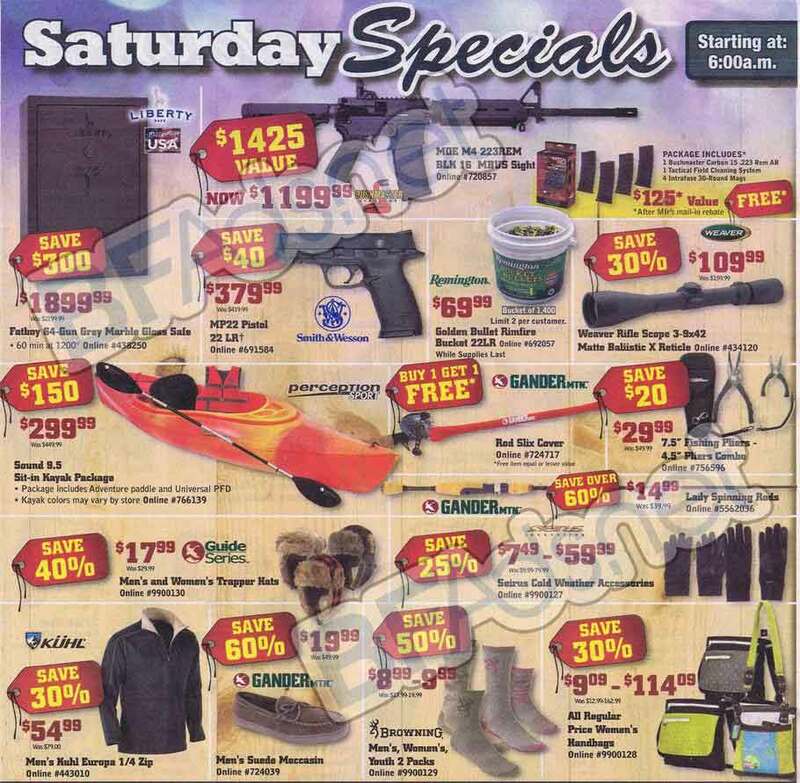 As expected, the ad contains discounts on many of the most trusted firearm brands, but you’ll also find plenty of gift options for family members who aren’t hunting enthusiasts, including camping accessories and apparel for women, men and kids. Price cuts on a broad selection of goods aren’t the only things shoppers can look forward to. 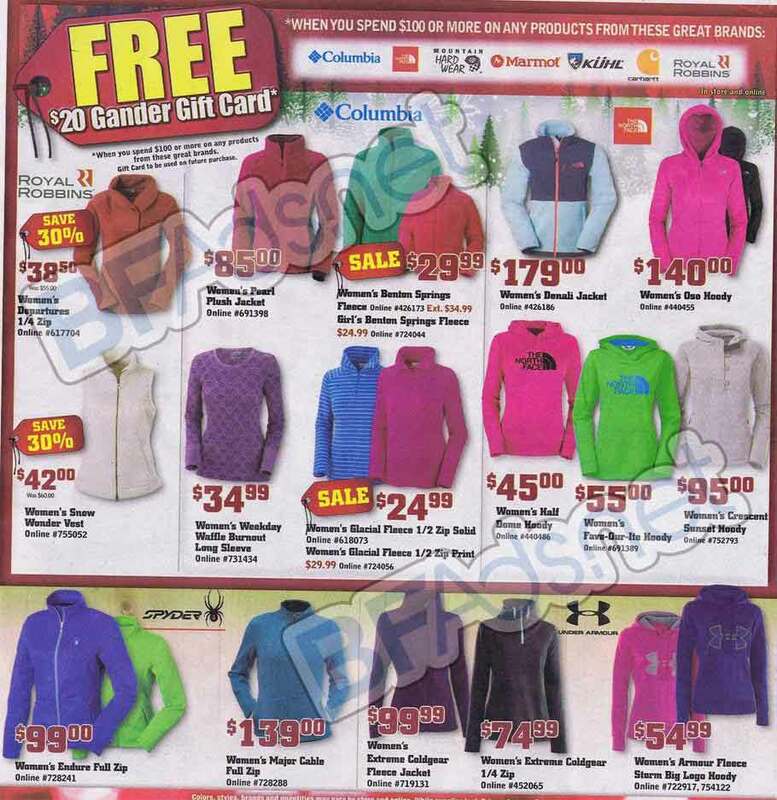 Customers who spend $100 or more on some of the most popular brands during this sale will receive a $20 gift card for their next visit to Gander Mountain. 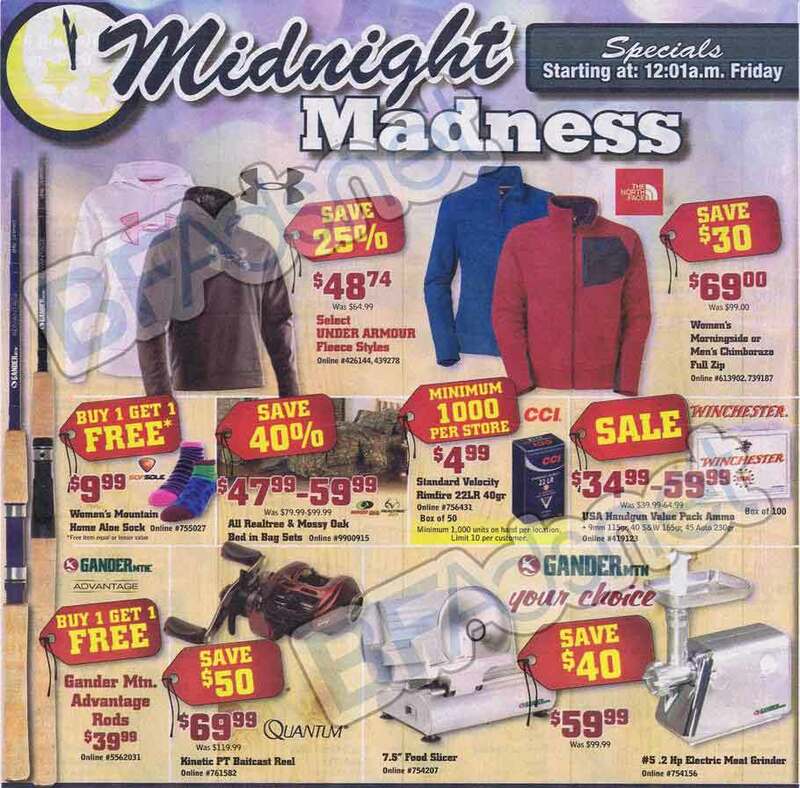 Both last year’s ad and length of sale for Ganger Mountain’s Black Friday deals from 2012 were extensive. 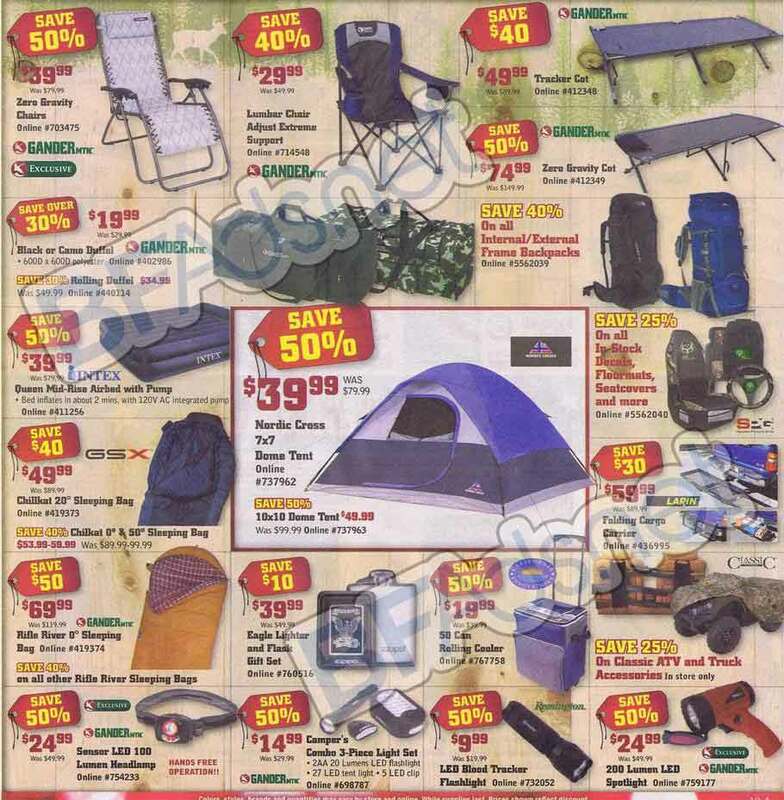 The ad came to a total of 357 discounted items and the sale lasted Thursday through Sunday, much longer than most stores. On Thanksgiving Day, it opened 9am until midnight; on Black Friday, it continued from 6am until 10pm; then, Saturday and Sunday had more normal hours, 8am-10pm and 9am-8pm. 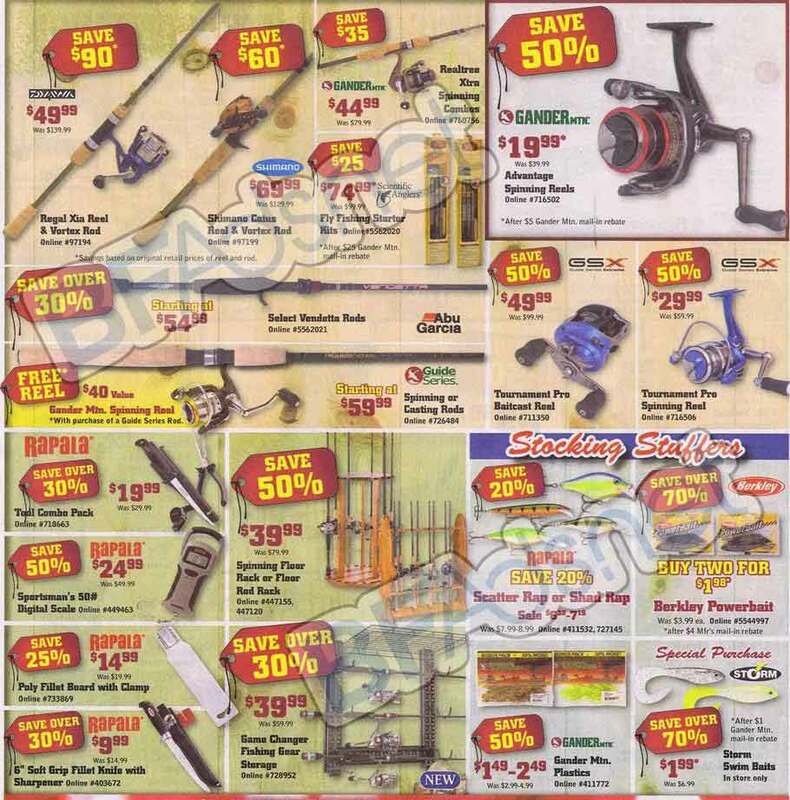 Some items had cut prices only on Friday but many had discount sales through Sunday. 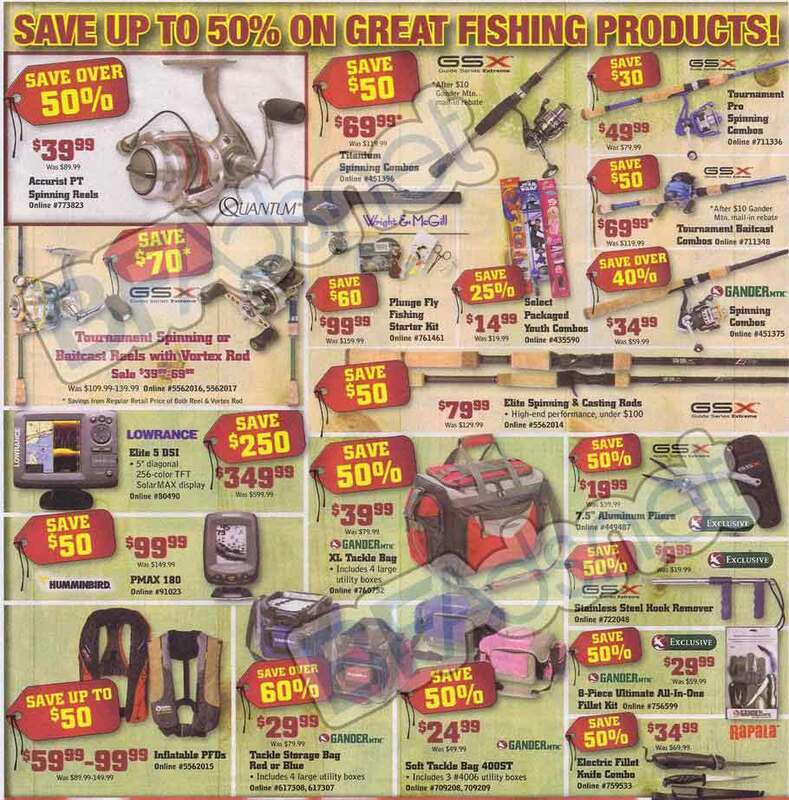 The outdoor superstore, with locations in 23 states mostly in the Midwest, carries a large collection of hunting and fishing equipment along with winter gear. 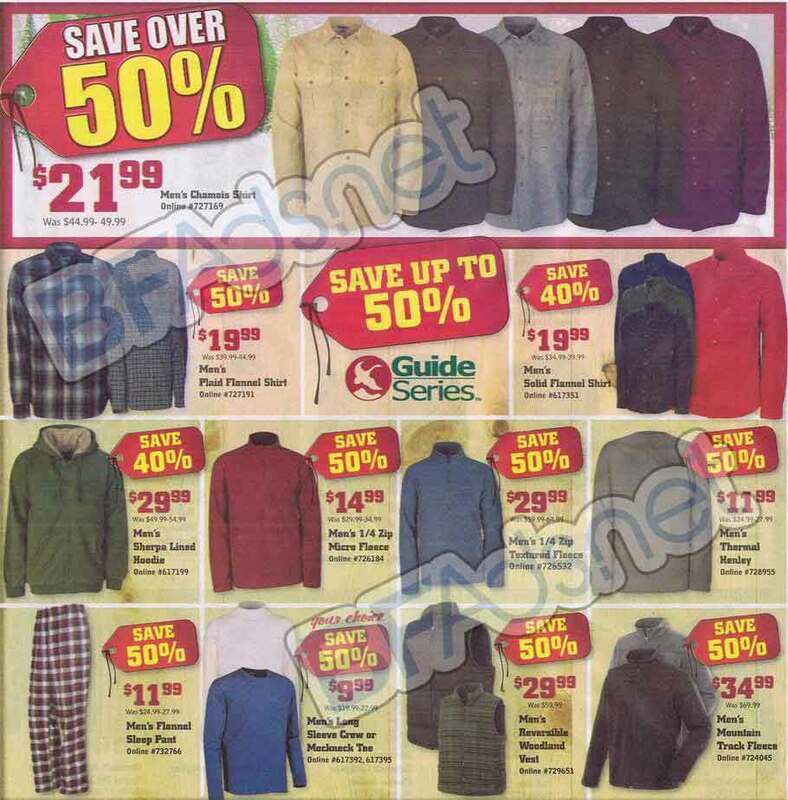 The clothing, mostly jackets, fleeces, boots, and slippers, had a very strong discount selection, with many 50% or more off. The $19.99 Lamo Womens Valerie Clog Slipper even went for 60% off, originally priced at $49.99. 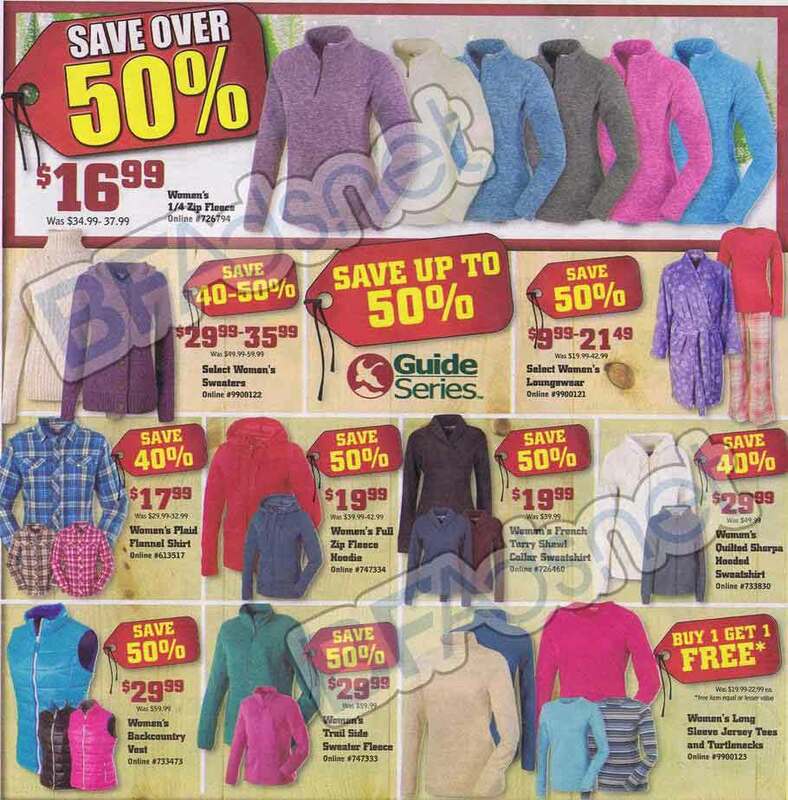 Ganger Mountain Boys Thinsulate Gloves, the Creekside Stretch Fleece Beanie (3-pack), and the White Sierra Womens Cozy Fleece Jacket only start the list of 50% off items. 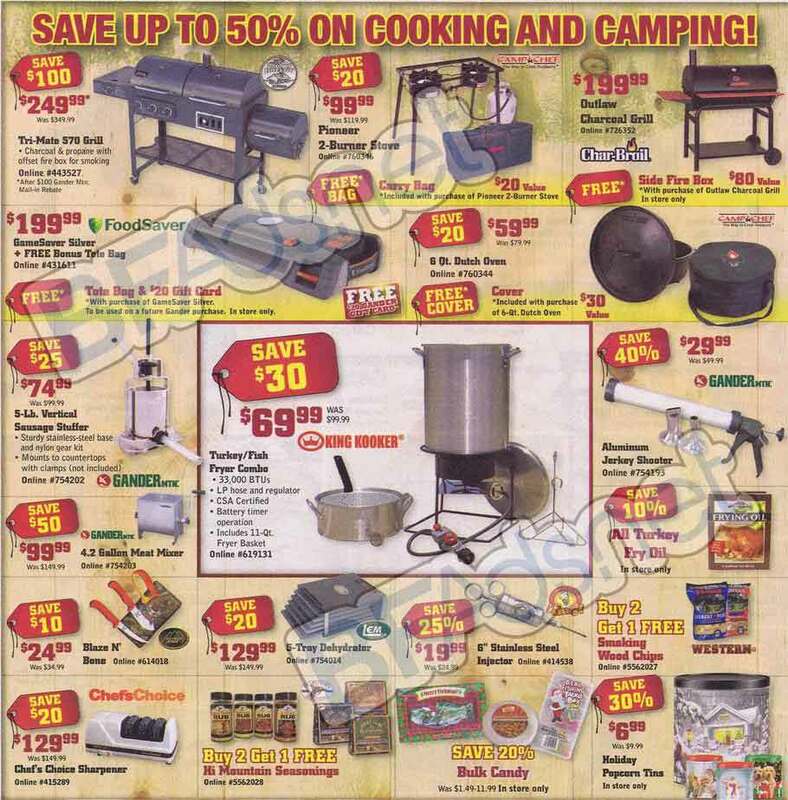 Cooking had a fair selection too, with items such as the Smoke Hollow Outdoor Leisure LP Gas Smoker down 50% to the price of $79.99. 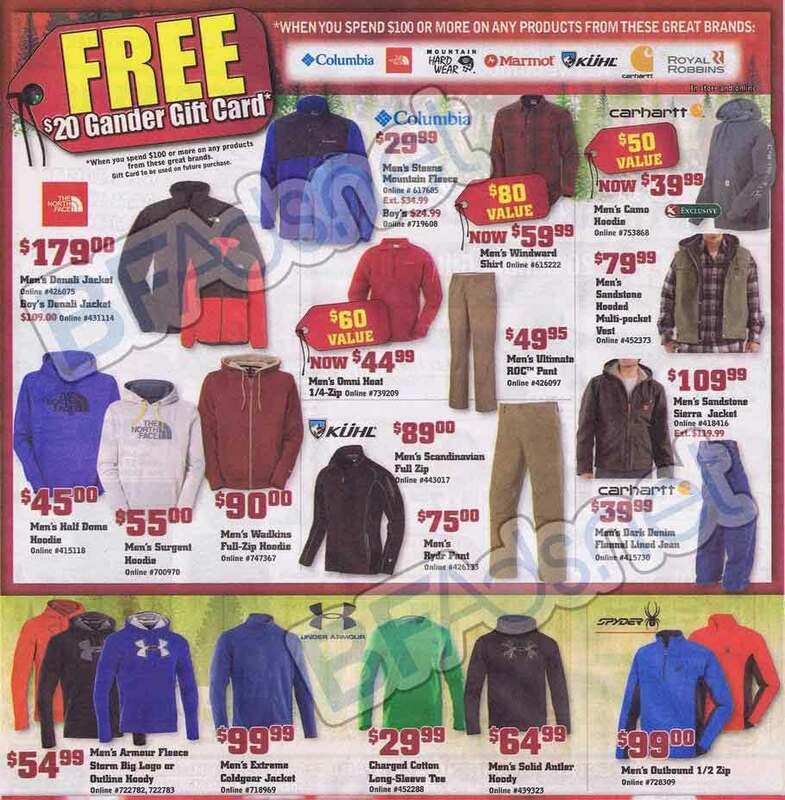 Plus, with purchases of $125 or more on select brands, buyers received a $25 Gander Mountain gift card. Now let’s take a look at the not-so-great sales from last Black Friday. Handguns had minimal deals, such as 10% off on the Ruger SR22 Handgun. 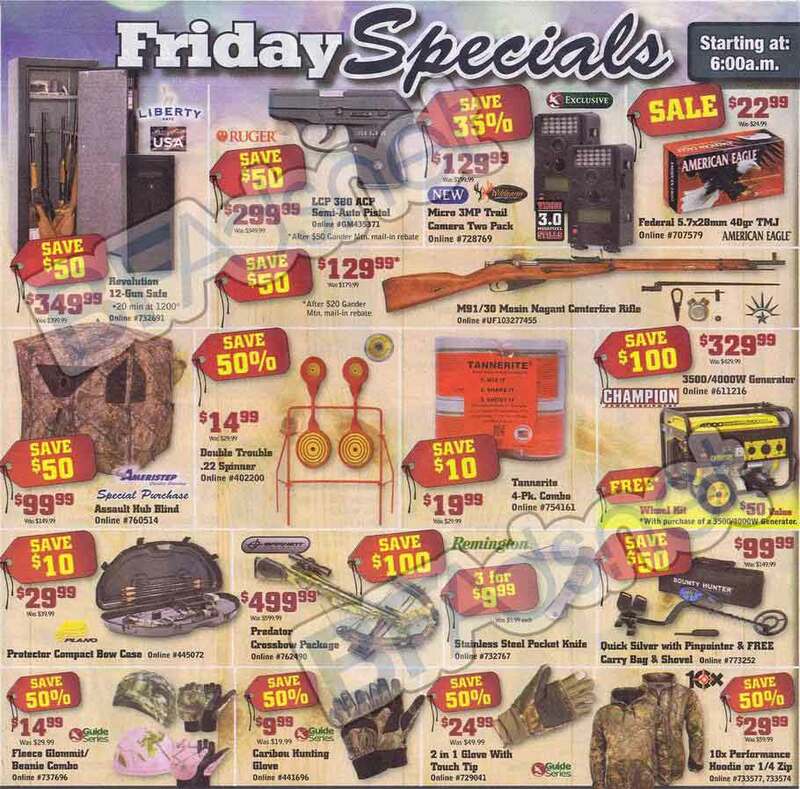 Guns in general, which were the more expensive items in the store, had the least amount of discounts. 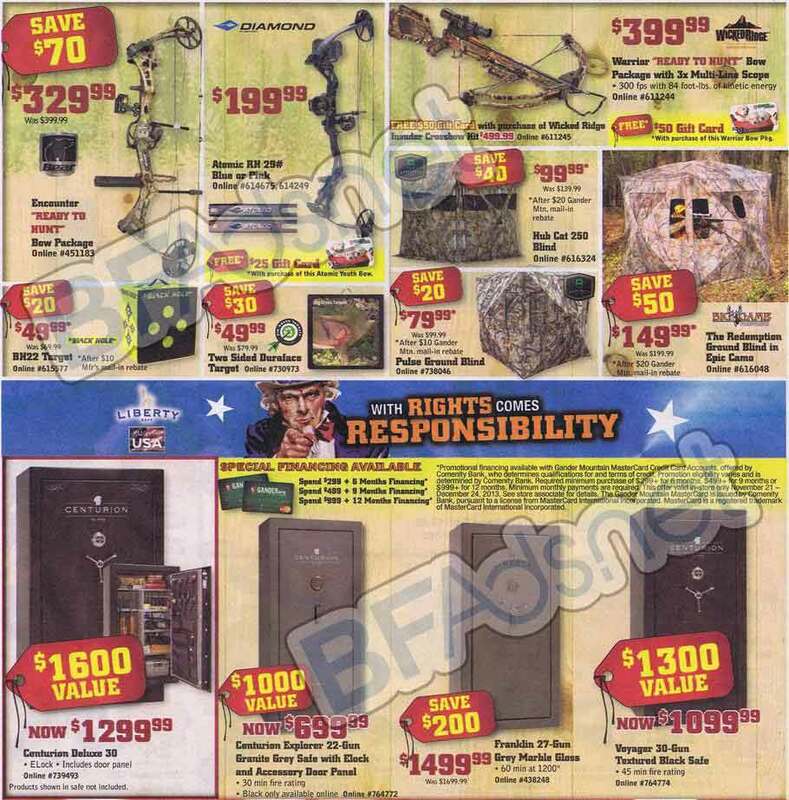 That said, deals were available for accessories of your weapon of choice, such as the 30%-off Simmons Rangefinder and the 29%-off Sportsmans Bow Case. Certain items only had discounts on Black Friday. 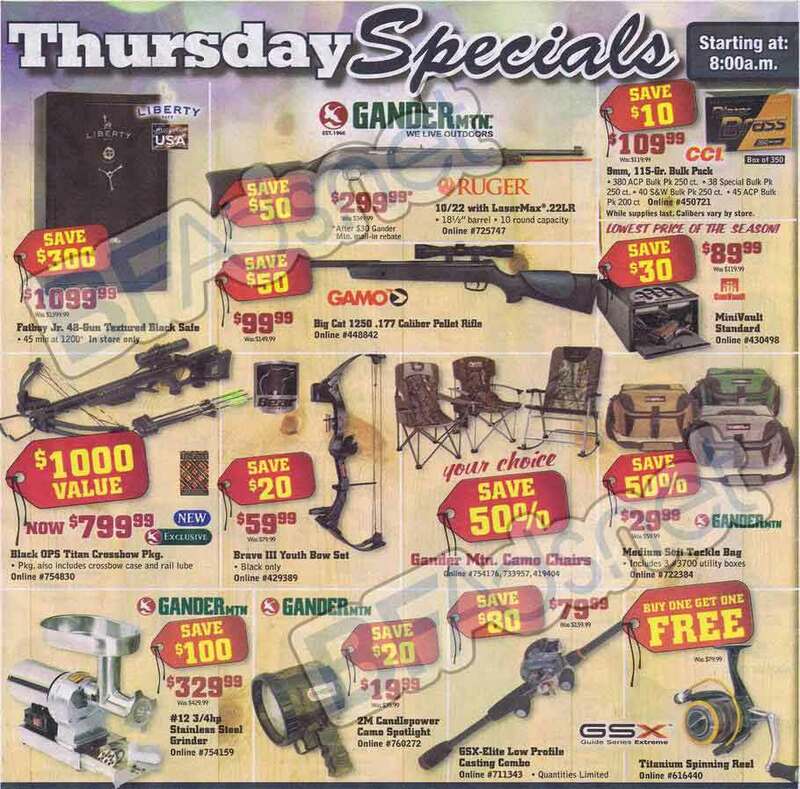 Although that list wasn’t too impressive, there were a few good buys, such as the $29.99 GSX Tournament Series Spinning Reel, the $19.99 Winchester Bowie Knife w/ Gift Tin (off-sale at $39.99), and the $299.99 Gamo USA Whisper Air Rifle with Noise Dampener. The bulk of the sale, though, lay in the Thursday and all-weekend discounted items. 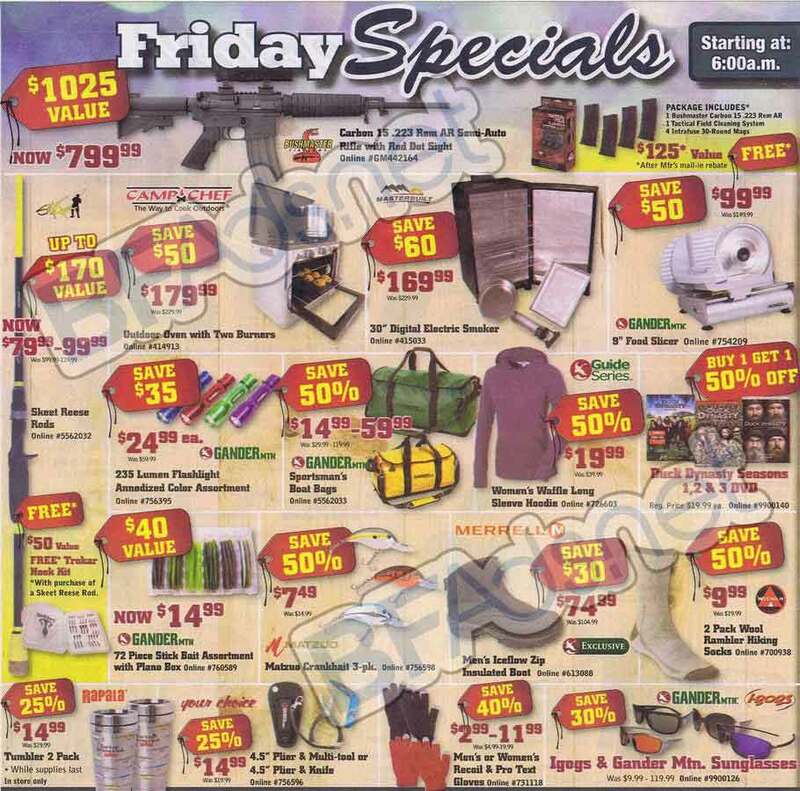 The results of the Black Friday sale for Gander Mountain were strong. 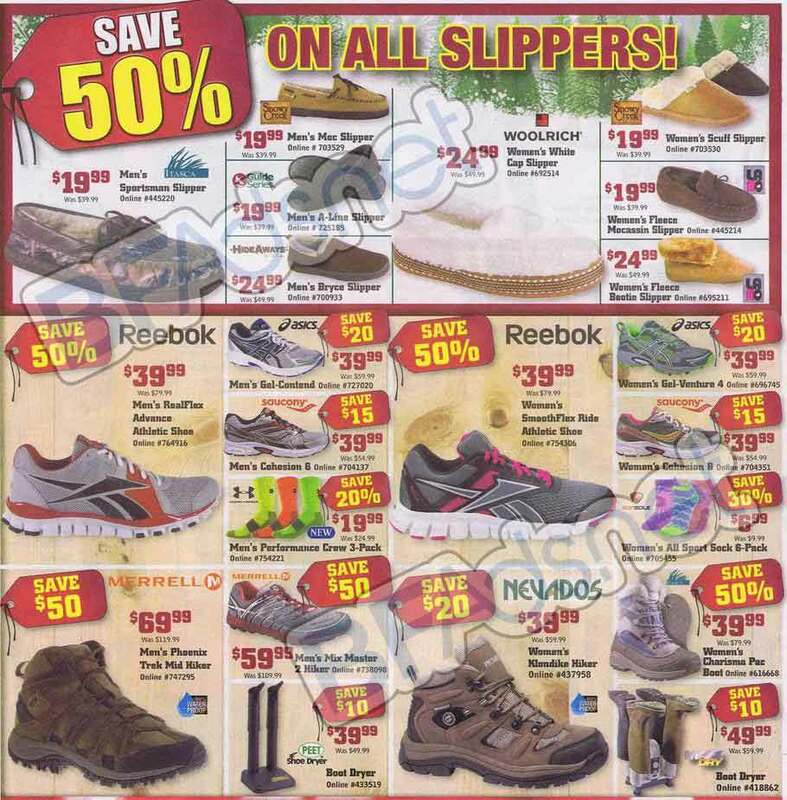 The numerous discounts on clothing and footwear paid off, as the category proved popular for purchases. 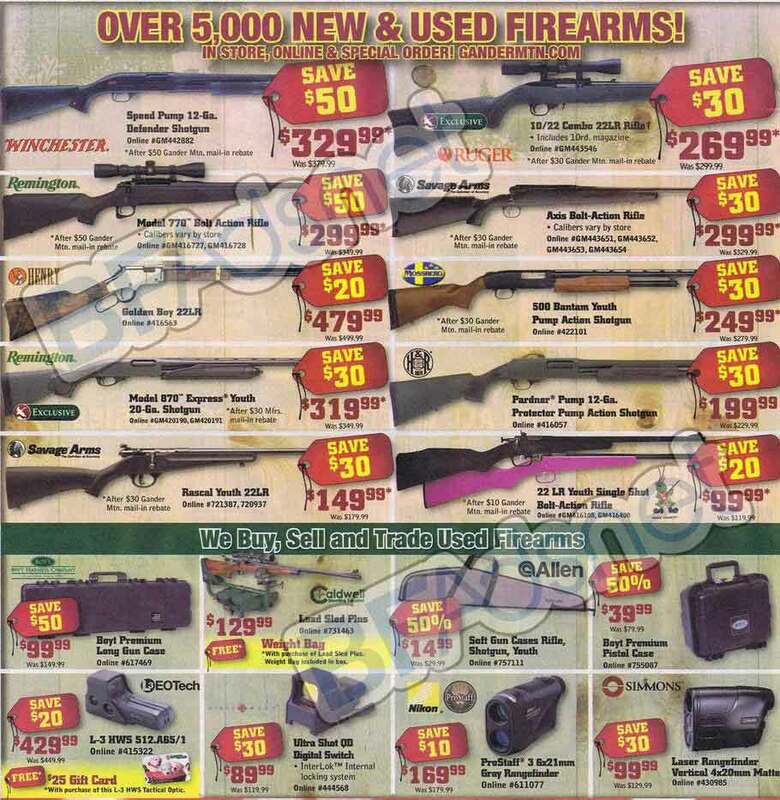 Firearms, though not discounted as much, maintained a strong sale too. Success arose perhaps from the earlier start, Thanksgiving Day, since the shopping traffic was steady for those two days leading into the weekend. 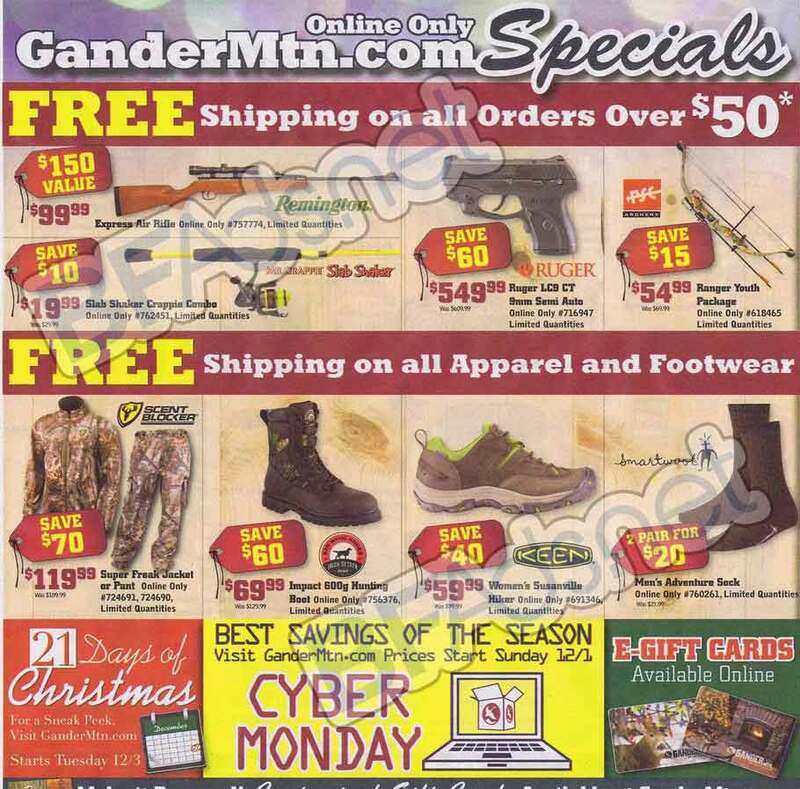 Want to know how NerdWallet’s review of Gander Mountain went last year? Check it out. 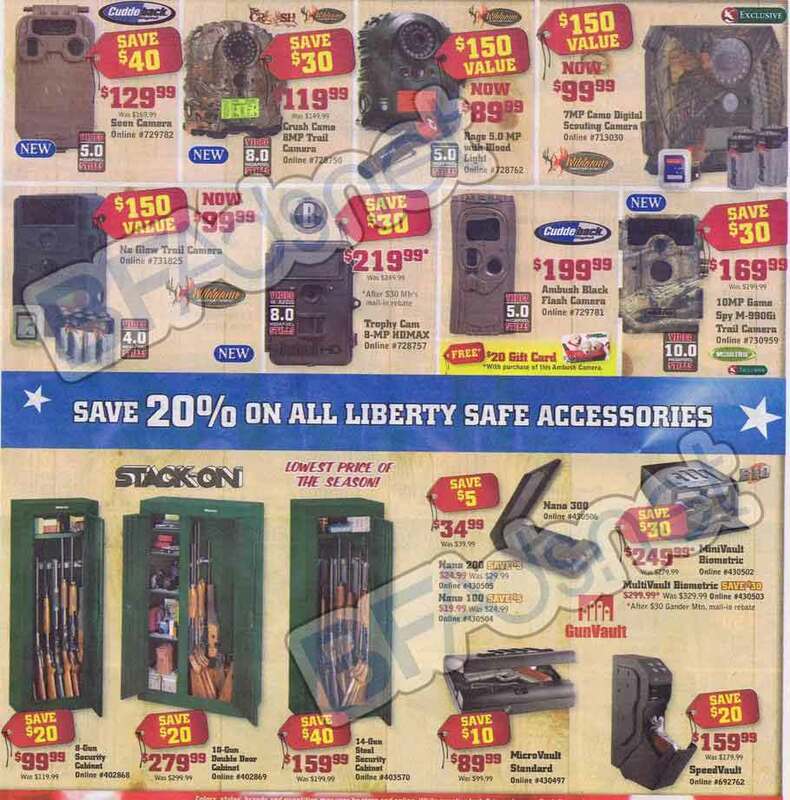 For more information on similar stores to Gander Mountain, click here. 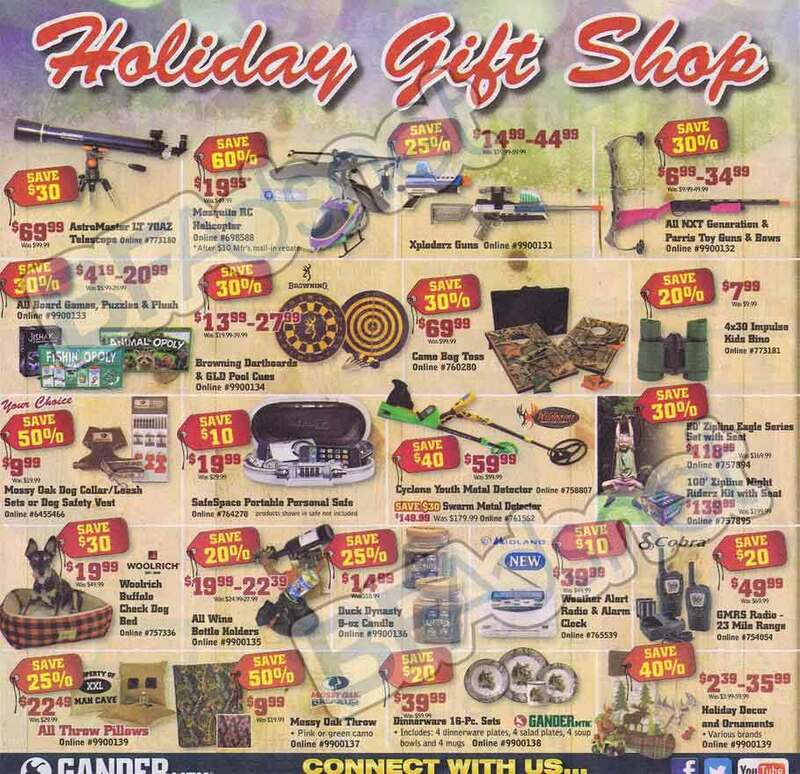 Gander Mountain holiday event is kicking off early, with the first round of sales running from 8am Thursday to 2am Friday. Stores will then be open from 6am-10pm Friday, 8am to 10pm Saturday and 9am to 10pm on Sunday. Check out the full listing of Black Friday Store Hours for opening times for more of the most popular stores!